If you want to develop more muscle, then you better get ready to do some hard work and prepare for slow gains. Learn about resistance training, diet and rest. I'm sure that most people who have performed some form of resistance training have wanted to increase their muscle mass at one time or another. But the body is just naturally lazy and will only develop enough muscle to deal with the loads placed upon it. So, if you want to develop more muscle, then you better get ready to do some hard work and prepare for slow gains, for the body will only respond to a combination of resistance training, diet and rest. Muscle growth comes about because of hypertrophy or hyperplasia. Hypertrophy is an increase in the size of the muscle due to an increase in the size of the muscle fibers, while hyperplasia is an increase in the number of muscle fibers. Hypertrophy comes in two forms, sarcomere hypertrophy, an increase in the size of the contractile portion of the muscle; and sarcoplasmic hypertrophy, an increase in the non-contractile portion of the muscle. Sarcomere hypertrophy involves a smaller increase in the diameter of the muscle, but muscle density increases. Sarcoplasmic hypertrophy shows an increase in muscle diameter and a decrease in density. All hypertrophy will involve both processes; the ratio is dependent on training intensity and frequency. Heavy training on a regular basis will make you feel solid whereas someone who trains for the pump with light weights will feel soft. If you are interested in improving performance, than strive for sarcomere hypertrophy. Sarcoplasmic hypertrophy is only beneficial if an increase in body weight is more important than an improvement in performance. Hyperplasia is the splitting of muscle fibers, resulting eventually in a greater number of fibers the same size as the originals. It has been said that the number of muscle cells one is born with is all they will ever have, and the splitting is not new fibers but damage to existing fibers. Russian sports scientists claimed to find hyperplasia in swimmers' shoulders. Swimming is training at a high speed with low resistance. Other researchers have produced hyperplasia in chickens and grouse by hanging them by their wings for a few days. I do not know if hyperplasia is possible, but if you want to do a little experiment, I would train at high speed as opposed to hanging yourself in a stretched out position for the weekend. The process of muscle growth is not known for sure, but most theories are based on the idea that lifting breaks down the muscle, and growth results from over-compensating to protect the body from future stress. The human body breaks down and rebuilds all of the muscles every 15 to 30 days. Lifting speeds up the process due to an increased need for fuel. Rebuilding peaks 24 to 36 hours after training and continues at increased rates for as much as 72 hours. The muscle hypoxia theory is that weight training decreases muscle oxygen content, and that triggers protein synthesis. It came from the fact that lifting loads over 60% of maximum temporarily cuts off blood flow. Restricting blood flow with a tourniquet does not result in muscle growth, and pearl divers are not overly muscular, so the muscle hypoxia theory can be thrown out. Another theory is that training increases blood flow and the increased nutrient supply is responsible for growth. It sounds good, but running increases blood flow and not too many distance runners have big legs. The ATP debt theory is that muscles use ATP contract, so ATP will break down and the waste products will trigger increased blood flow and growth. It has been discounted because ATP levels are the same following exercising to failure as at rest, and runners still do not have big legs. The energetic theory that is currently the most accepted is that muscle has a certain amount of energy at any given time, for growth, repair, and movement. Soviet sport scientists have referred to this as an individual's current adaptive reserve. Over time, with a lot of hard work, the body becomes more efficient at breaking down and rebuilding muscle, which shows an increase in the current adaptive reserve. Increased energy supply allows more work to be accomplished, followed by increased growth. Medvedyev, the long time Soviet weight lifting coach, wrote that training volume is the determining factor in muscle growth. He recommends that if a weightlifter wants to stay in the same weight class, he should train with singles, and if the lifter is trying to go higher a weight class, he should train with sets of three to six reps.
Anthony Ditullio adds that strict exercise performance, minimal rest between sets, and the volume of work in a limited time are the primary factors in muscle growth. Obviously, the more work performed, the greater need for energy. A maximum single is the most work that can be performed in an instant, but because it lasts a limited time, only a small amount of protein is broken down. High repetition sets with light weight also require a small amount of fuel supply. Medium repetition sets with maximum weights require a larger fuel supply, resulting in an increased protein breakdown, which leads to a bigger rebound in energy stores and increased muscle growth. 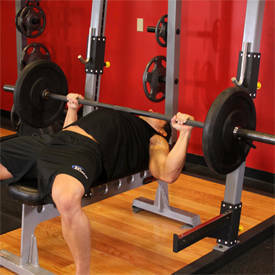 Lifting weights is a stress, and to counteract the stress and as part of the super compensation, hormones are released. Growth hormone, insulin, insulin-like growth factor, testosterone and cortisol are the hormones released after or during weight training. Cortisol breaks carbohydrates down for fuel. Growth hormone, insulin, and insulin-like growth factor work together to inhibit the breakdown of muscle by increasing nutrient flow into the muscle. Growth hormone is released in greater amounts following exercise and controls the release of insulin-like growth factor, which is the primary anabolic hormone. Testosterone stimulates the nervous system to send stronger signals and signals the muscle to rebuild. Growth hormone, insulin, and insulin-like growth factors are now being used as performance enhancers to increase muscle mass, and even though they are banned substances, they are difficult to detect. Proper nutrition is necessary, most specifically protein! Nutritionists recommend less than one gram of protein per kilogram of body weight or less to maintain health, but more than two to three grams of protein per kilogram have been recommended for weight gain. Protein is used for growth, repair and hormone production. Only twenty to thirty grams of protein can be used at any time except following exercise or fasting; additional protein ends up being stored as fat. This supports eating several small meals throughout the day. The great Paul Anderson and Doug Hepburn and others famous for their muscle mass put an emphasis on liquid protein because liquid foods are easier to digest in greater quantities. The liquid protein can be consumed during or immediately following exercise. Michael Salvanti, who put a lot of effort into studying what it takes to increase muscle mass, gained twenty pounds in four months, after not gaining any weight in the previous four years, by drinking eight ounces of his protein shake. Salvanti scheduled his shakes as a part of his training program. Consuming protein and carbohydrates right after lifting has also been shown to increase insulin release and speed up recovery. Research has shown that in order to increase muscle mass, stress must be put on the body, leading to increased hormone release, and increased flow of nutrients into the muscle, and with rest, muscles will grow. If someone asked me what they should do to add some serious amounts of muscle, I would recommend three sets of 8 to 12 reps with all the weight that you can handle for the bench press, bent over rows, combined with a light set of 8x12 reps for full squats, followed by an all out set of 20 in the parallel squat. I would finish each training session with stretching and cool down, light aerobic work and a large protein added shake. On non-lifting days it is essential that you rest and work out the kinks with a swim, or walk or light bike, but do nothing that involves impact. Best of luck and remember, "luck is when opportunity meets preparation." Ditullio. The Development of Physical Strength. Kraemer. Hormonal Mechanisms Related to the Expression of Muscular Strength and Power. Medvedyev. A System of Multi-year Training in Weightlifting. MacDougall. Hypertrophy or Hyperplasia Strength and power in Sports. Silvanti. The Production of Muscular Bulk. Zatsiorsky. Science and Practice of Strength and Power.